The University of Akron’s Earth Day “Do it now for the enviROOment” was last Wednesday. It was really a fantastic event, and generated a lot of student interest by showing practical renewable energy solutions. There was a wind turbine, 4 cars, a VegiTerranean food demo, bicycles, the Akron Metro RTA, a rain barrel, and so much more. The outside stage was powered by solar panels – Renewable energy in action! 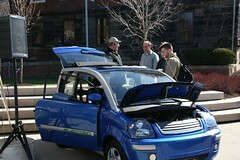 It was so great to see the students checking out the electric cars. The Myers Motors NmG was featured, along with the Zenn electric car, and a self-converted Honda DelSol. Dr. Ross brought his biodiesel VW Beetle. It’s simply a diesel beetle which he runs on used vegetable oil from VegiTerranean. I love the NmG from Myers Motors. It’s a one-person car, which is so practical. We all drive 5 person cars, but we only have 1 person in it for a majority of the time. Why not drive a 1 person car? And then have another car for family trips. Technology usually innovates to match our lifestyles, but continuing to make 5 person (or more) cars is one area where innovation has fallen away. It would make sense for each family to have a 1 person car, and a family car. Myers is currently working on new battery technology to make it run longer. They would also like to make a 2 person car. I loved the biodiesel VW Beetle. By using vegetable oil, he can operate his car cost-free. He simply separates particles from the oil and pours the pure oil into his car. Diesel engines were meant to run on vegetable oil, so this solution is so efficient. It’s a pure reuse. Instead of using ethanol, which comes from harvested plants, biodiesel reuses oil that normally would have to be processed. I’ve never heard of a Zenn before. Looks kinda neat, but speed maxes-out at 25mph. That might be fine for driving around the neighborhood, but it’s not going to cut it on the road (I think Vespas go faster than that, yes)? It would be cool to drive around town in a Zenn. Not Akron – maybe a big city with a lot of stop and go. I think they market their “fleet” to campuses, airports, etc. The potential is great. I wonder why the NmG can go regular speeds, but the Zenn doesn’t. Want to protect the earth and save energy? Then stop all wars, conflicts and terrorism. How do you do that? Make the United States free of foreign oil. When the US is energy independent there will be no more oil wars and the terrorists will no longer be able or interested in reaching us. This will save lives AND energy. Let’s study what Denmark, France, Brazil, and Australia have done on diversifying their energy supplies and do likewise. Let’s drill wherever we have oil and put a new nuclear power plant in every state. Let’s use all our coal and natural gas. We don’t need foreign energy. And we will be safer, greener, and richer with out it. All of the earth’s natural resources will be eventually used by someone at some time. Would your rather these resources be recovered in an ecological friendly and sustainable way by the US or that some dictator who could not care less about the environment exploit the earth. All alternative sources of energy will take decades to bring online because their conversion efficiencies are not yet high enough. Eventually, the US will lead the world into a sustainable green economy, but energy independence comes first. It is the low hanging fruit and gives immediate benefits now.